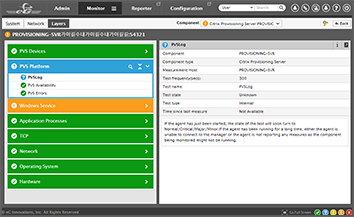 Citrix Provisioning Services (PVS) are being widely used in large scale application and desktop virtualization environments. Bottlenecks in the PVS servers can lead to slow boot times or cause desktops and applications to be unavailable. eG Enterprise is one of the few solutions in the market that provides deep visibility into every aspect of Citrix Provisioning service performance, irrespective of whether the server is deployed on a physical or a virtual machine. Since users do not directly access PVS, slowdowns or failures of PVS are hard to detect. 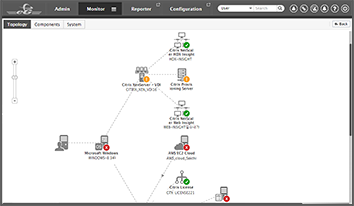 Furthermore, because there are several underlying tiers in the Citrix infrastructure, when slowness is detected, an administrator often has to spend a lot of time determining exactly where the cause of the problem lies. 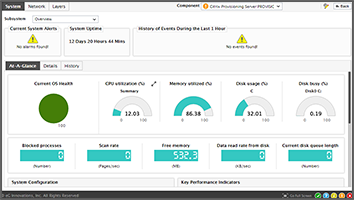 In-depth visibility and analysis of key performance indicators at the server operating system (particularly IOPS and memory), the infrastructure (key services, errors, etc.) and the application layers (e.g., the vDisks, the target devices, the write cache, PVS sites, PVS connections to license servers and data stores, etc. ) are the keys to identifying PVS problems proactively. eG Innovations provides the best value for the money coupling visibility and excellent reporting. Using their automatic root cause analysis we avoided throwing $$ at the problem and realized $20K in savings - immediately. Are all the provisioning servers in a site available and responding to target device requests? Are there any inactive vDisks in a site? Which ones? Is the PVS server's RAM sufficiently sized? Which vDisks are not connected to any target device? Are any vDisks locked for a long time? What is the number of times a target device had to retry an I/O transaction?